The Sustainability Studies Program at Roosevelt University recognizes the passing of Mr. Jerome H. Stone, Chairman Emeritus and Life Trustee of the university, who died on Thursday, January 1, 2015. Mr. Stone, 101 years of age, was one of the most important and influential people in the history of Roosevelt University, a champion of adult education, and a benefactor of the Evelyn T. Stone College of Professional Studies. The tribute to Mr. Stone below was released to the Roosevelt community by Board of Trustees Chairman Jim Mitchell and University President Chuck Middleton. Mr. Jerome Stone joined Roosevelt’s Board of Trustees in 1953 at the age of 40 because he was impressed that Roosevelt, eight years old at the time, offered classes at times convenient for working students. 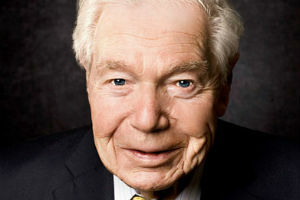 He remained an active Trustee since then, serving as chairman of the Board from 1969 until 1984. Jerome Stone’s continuous dedication to the University through the service of all five presidents, his commitment to the guiding principles of our mission and his generosity in giving of his time, his talent and his treasure made him the ideal trustee. Mr. Stone’s long and emotional attachment to Roosevelt University can be traced to his friendship with founding President Edward James Sparling, whom he met before Mr. Sparling established the institution in 1945. In recognition of his many contributions to Roosevelt, the University’s Evelyn T. Stone College of Professional Studies is named for Mr. Stone’s late wife. Mr. Stone’s involvement with Roosevelt was just one part of a lifetime filled with business and civic leadership. Among other activities, he helped build Stone Container Corp. into a multibillion dollar firm, he founded the Alzheimer’s Association and he was a major benefactor of Chicago’s Museum of Contemporary Art. Funeral services will be on Tuesday, January 6 at North Shore Congregation Israel, 1185 Sheridan Road, Glencoe, Ill. at 11 a.m.
Also see these obituaries for Mr. Stone in The Non-Profit Times and the Chicago Sun-Times. This entry was posted in education, news, Roosevelt, service. Bookmark the permalink.